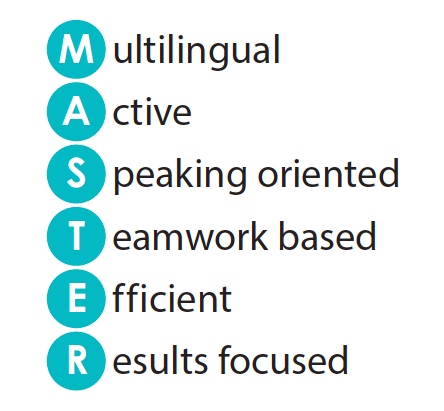 M – our multi-lingual, quality-conscious team are masters in many languages and can assist you quickly and efficiently any time. A – every language course is interactive with varied learning techniques and an interesting program. S – is about speaking in our courses! 60-70% of speaking comes from the student. You can be sure that what you have learned is also applied. T – every interaction requires cooperation, only this way can the desired goal be achieved. 50-50 is our principle. E – if all 4 previous points are respected then nothing stands in the way of success. R – we always work according to a tailor-made program, you decide what you want to learn and we take you there!